The silence made my ears ring. No electronic chirps, no roar of jets overhead, no sounds except the softly lapping waves on the sturdy wooden hull and the whisper of wind in the sails. An occasional screech of one of the many bald eagles inhabiting this archipelago out on the edge of the West Coast Continental Shelf shattered the calm. The giant bird swooped down, landing in a gnarly spruce tree clinging to the rocky cliff. Regally he stared down, watching Passing Cloud, the interloper, sail past. Passing Cloud reaches through a passage off Haida Gwaii. 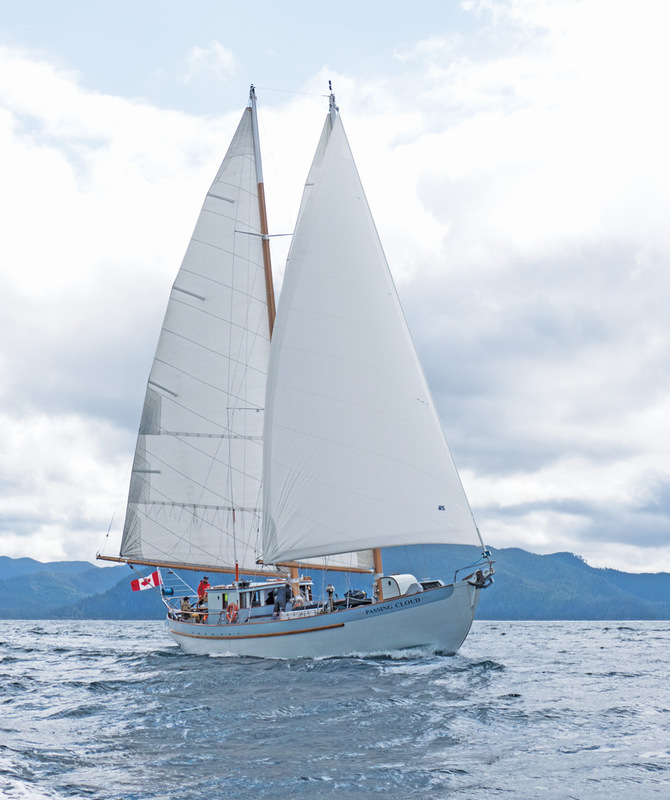 We were aboard Passing Cloud, the William Roué-designed 71-foot schooner, built in 1974 in Victoria, British Columbia by Brian Walker. Designed for cruising, she nonetheless proved to be surprisingly fast, winning many Northwest races including the 1984 San Francisco Master Mariners Race, the first non-Americans to do so. Considering Roué also designed the famous Bluenose, this wasn’t surprising. She logged thousands of miles over the years, down the coast and south to Tahiti, before returning home to British Columbia where, in 2012, she was bought by Russ Markel, founder of Outer Shores Expeditions, small-ship, niche adventure travel company operating wildlife, wilderness and cultural expeditions in the Northwest. I was hesitant to explore this place that time had almost forgotten, as everything I had read about the islands and the expeditions confirmed that it would be wet and cold, two situations I try to avoid. Nevertheless, I forged ahead. Reading the clothing list stressing layers and long underwear, wool socks, gum boots, warm everything and foul weather gear, my enthusiasm flagged. Haida Gwaii, an archipelago formerly known as the Queen Charlotte Islands, was not an easy place to reach and boarding Passing Cloud in such a remote location added to the complexity. A very early morning flight brought me from Los Angeles to Vancouver, then another two-hour flight to tiny Sandspit on Moresby Island, an overnight at the handy Sandspit Inn, a shuttle van and then a small car ferry to Skidegate. I stopped at the Haida Heritage Center for the very informative orientation that is required of all visitors to Gwaii Haanas National Park Reserve, National Marine Conservation Area Reserve and Haida Heritage Site, the collective generally referred to as Gwaii Haanas. By late afternoon, two other passengers and I boarded a 1950s de Havilland Beaver float plane, and gazing down at the dramatic coastline as it passed just a few hundred feet below. My excitement grew. The crew enjoys hot coffee on a cool morning. With headgear firmly in place, I listened to our pilot Peter chat with our skipper Matt aboard Passing Cloud as we neared Rose Harbour on the northern shore of Kunghit Island. Skimming the surface, gently settling onto the glassy-smooth waters, we unloaded into the big RIB with Matt and first mate Kyle, then sped over to Passing Cloud, anchored quietly, all alone in the protected bay. We watched from the deck as the plane, our last connection to civilization for a week took off, disappearing in the distance. With no specific itinerary, we sailed at the whim of weather and tides, but we had the intention of visiting all five Haida villages during the week aboard. 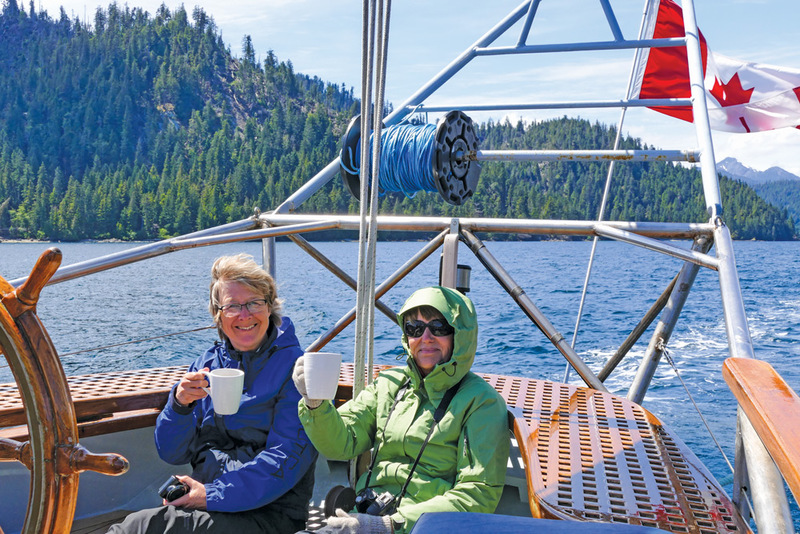 Bundled up on deck with coffee in hand, I gazed around at the land that surrounded us as we got underway—rocky islets, soaring cliffs and far-off mountains of the San Christoval Range still topped with snow. No wonder it felt so cold. But it was breathtakingly spectacular.